As Saint Paul told Saint Timothy: “All scripture inspired by God is useful for teaching and refutation, for correction and putting us in the way that is right with God, for communication and communion.” For our lectio we can use any text of scripture we want. Some like to open the Bible at random to see what the Lord has to say to them today. This is fine, though we should avoid all superstitious attitudes, looking for the Lord to give us through the Bible infallible answers to particular questions. That is not usually his way. He has given us a mind to use and the constant help of Holy Spirit. 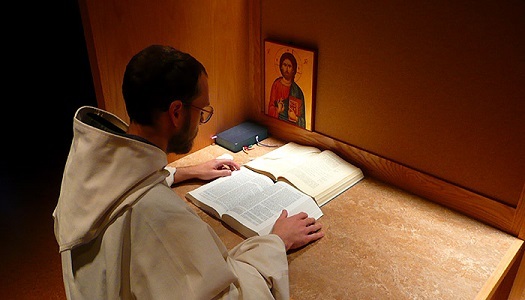 Many prefer to use the readings of the day for their daily lectio. This is very good. Listening with the church, there is special grace present. Apt passages from the Hebrew Bible and the apostolic writings are given us as a rich setting for hearing the Gospels. When these texts are used at our lectio we can then easily share with others in the church who are doing the same. However, restricting ourselves to these does have the disadvantage that some passages of scripture will never be read, for they are not among the passages used in the liturgy. Others like to follow the lectio continuata, which has been the common practice in monasteries. Certain books of the Bibles are assigned to particular seasons of the year: Isaiah for Advent, Jeremiah for Lent, Lamentations for Holy Week, the Epistles of John for the Easter time, and so on. During the assigned season, the book is read through, chapter by chapter. Most find their preferred lectio in the Gospels, and so some will read these through. The Gospels certainly are a good place for beginners to start. Some of us have favorite passages in scripture and like to return to them. But we soon enough find, sometimes to our surprise, that these much-loved passages can be used by the Lord to bring us very different messages on different days. For the Lord always speaks to us right where we are today. This is one of the things that makes lectio such a rewarding experience. It is always relevant, and therefore it is always new. It is a living Word speaking to us in the onrush of life. We can also choose texts from men and women of faith, friends of God. As long as they are “faithful” in their writings, theirs are writings drawn from and reflecting the Word of God. Indeed, the writings of those special friends of God, whom we call the Fathers of the church, are often so full of the inspired Word that they are veritable mosaics of scripture. They leave us with the strong impression that these writers knew the Bible by heart, indeed, carried it in their heart. However, I personally think that for the most part we do best turning to the inspired Word itself for our lectio and using the other texts more for study and motivational reading. Among my favorite texts are the words that came so directly from the heart of Jesus as he spoke to his chosen twelve at the Last Supper. He tells us then: “I no longer call you servants, but friends, because I make known to you all that I have received from the Father. . . . You have not chosen me, no, I have chosen you.” Wondrous, indeed, it is: to be the chosen friend of God himself! Let us take a little look at this tremendously beautiful reality called friendship. Well, first we get acquainted. Perhaps we go to a party. As we enter, the hostess comes over to greet us and guides us across the room to meet another guest: “Maria, this is Robert. Robert, this is Maria. I know you are both interested in scuba diving.” Then our charming hostess glides off to welcome someone else, leaving us standing there facing one another. “What did you say your name is?” We take up the conversation. “Where are you from?” “Are you really interested in scuba diving?” If the evening goes well, there is a good chance that before it ends Robert will say to Maria: “What are you doing Saturday? Would you like to go scuba diving?” Robert and Maria will have become acquainted. Well, they do go scuba diving on Saturday, and soon they are doing other things together. As they do, they begin to know each other better, more now through the way they act and the things they share than just their words. They get to know each other’s likes and dislikes, what they value, and where they agree. They get to be quite friendly. If this goes on for some time, they may come to be real friends. A friend is someone who is there for you, one you can count on. If you are going away for the weekend, you call on your friend to take care of the dog. If you run out of gas, you call your friend. If you need a shoulder to cry on or want to share a deep personal joy, you turn to your friend. Your friend won’t let you down. As a friendship matures, it can give birth to a deep sense of oneness. There is a joy in being together, a good sense of being. And it might well happen that Robert and Maria will walk down the aisle and make their vows so that they can be together until death does them part. From acquaintanceship a friendly relationship can grow to produce true friends, who can come to know a deep oneness or union in spirit. The traditional Christian way of lectio takes our Lord’s words seriously. It is a response to his overtures, his choice. It is a way of friendship. We get acquainted with God through his Word. Of course, he knows all about us, but we need to get to know him. And getting acquainted is not a once-and-for-all thing. Very many marriages fail, sometimes after years of married life, because the man is still in love with the woman he went on the honeymoon with and does not know the magnificent woman who has matured at his side. And vice versa. There is a wonderful movement called Marriage Encounter. After an initial, vitalizing, long weekend, the participants are sent forth with a commitment to “ten and ten.” The partners commit themselves to spend ten minutes each day writing to each other revealing just where they are in their life’s journey and in their relationship with the other. Then they exchange the letters. After they have had time to read them and reflect, they spend at least ten minutes talking frankly about what they have written. The Lord has sent us wonderful love letters in the Scriptures. Our lectio is part of our “ten and ten,” enabling us each day to become more fully acquainted with him, and in that relationship getting more fully acquainted with ourselves. As we carry the word we have received at lectio with us, the Lord walks with us, commenting through that word on the things we experience through the day. It enables us to begin to see things more the way he sees them as well as to experience that he is there with us, helping us and supporting us in all. A few hours later, I was walking down from the monastery to the guesthouse. As I walked along, my word was with me. Suddenly, I realized that I was not just walking down a road. I was walking in the way. That all the walking I do, whether in the cloister, or out on the road, or in the streets of the city, or along corridors – it is all in the way. It is in the Lord and with the Lord and on the way to life eternal. Since that morning all my walking has been different: it has been in the way. Through his Word, my Friend enabled me to see things more his way. When I arrived at the guesthouse, there was a young man waiting for me. He had all the problems in the book and a few that weren’t. As I sat there listening to him, I was asking the Lord: “What do I say to this poor dear lad.” Then the Lord sort of poked me in the ribs. Oh, yes! And I told the young man about my Friend, who is the Way. As I shared this word with this fellow, it was as if great burdens were falling off his shoulders. Now he had a way to go. The Lord had given me that word that day not only for myself but also for this other friend of his. Later that day, around 4:45, I was climbing up the steps to the church. There are more steps between the guesthouse and the church than I have ever had the courage to count. I was exhausted. It had been a very full day. And I was saying to the Lord: “Lord, how will I ever get through Vespers? I will sing every note flat.” And once again he kind of gave me a little poke. “Oh, yes! 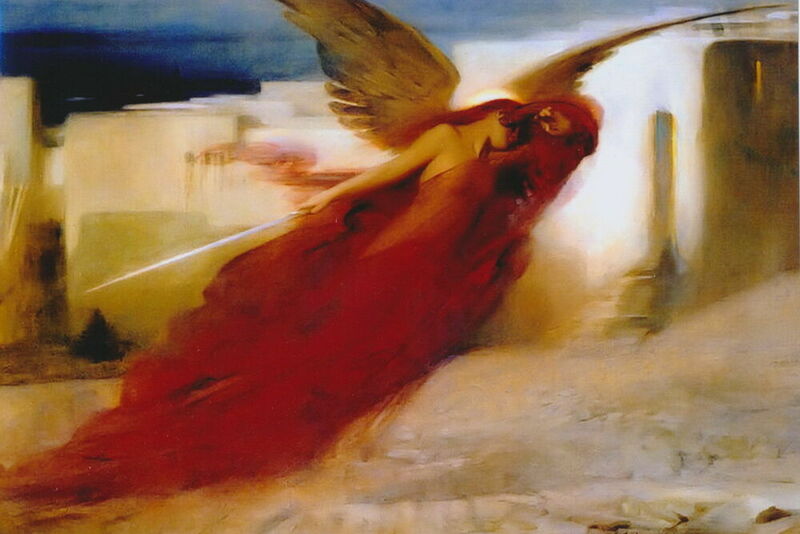 You are the way.” And I went on to sing Vespers with my Friend with a lot of energy and joy. Our Friend is someone we can really count on. Saint James tells us in his epistle that the reason our prayer is not heard is because we are like the waves of the sea: up and down, up and down. I believe, I don’t believe. I trust, I don’t trust. Our Lord has told us that if we tell yonder mountain to move and do not waver in our hearts, it will move. But we waver all over the place. Through lectio and meditatio we come to know what friend we have in Jesus. We arrive at the place where we can truly pray. And then there are those times when enough is said. We don’t need any more words. We just want to be there with the Lord. We hear his pressing invitation: “Come to me, you who work hard and are overburdened. I will refresh you.” And we sit quietly there, content with the poverty of a single simple word that says it all. It is the way of Christian friendship. God is not truly God for us if we do not listen to him. If God is who God is – if we know this, we listen to him. We acknowledge all this by listening. If we do not listen, we virtually deny that he is God, at least in relation to our lives. This is just the fundamental relationship between Creator and creature. By its very self, our listening postulates lectio. But we have been called to so much more. Not just creatures called to listen to a Creator who has every right to demand anything and everything of us. Not just servants: “I no longer call you servants.” But friends. What are the rights that a friend has to demand that we listen? And what kind of a listening can he or she rightly expect? We dare to come to lectio as friends with heartfelt longing truly to hear our Friend, truly to understand, that we might understand him and be more and more one with him. We come to lectio with a great longing for union, the union we call contemplation. (That word, too, might well be retired to give place to a word not so loaded with baggage.) Our lectio postulates a very special kind of listening, a listening that gives tremendous meaning to our lives. It is a listening that is filled with faith and trust, hope and love. It is the kind of listening that makes lectio one of the most wonderful things in our lives. In this listening, our lectio is a time that comes to be filled with what is the greatest joy of human life, a time of being with – being with our most intimate Friend. For the wonderful gift of lectio, can we ever thank you enough, O Lord? For here you show us that indeed you are our Friend, for here you make known to us all that the Father has made known to you, all the deepest meaning of our lives, all the secrets of your own life in the Trinity, all that we are called to, all to which we aspire, all the longings of our heart.